Experimente uno de los muelles de madera más largos del mundo con un boleto combinado para el tren Busselton Jetty y el Observatorio Submarino. Disfruta de magníficas vistas de Geographe Bay mientras recorres el ferrocarril Busselton Jetty, luego maravíllate con los coloridos corales y la exótica vida marina en una visita guiada al Observatorio Submarino. 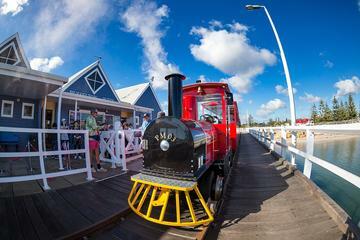 Nice, easy fun in Busselton. Cute train ride out to the underwater observatory. Very neat experience at the observatory. Beautiful sunshine and sea place! Fantastic volunteers serving the community. Given more time, do try the walking than taking the jetty train which is just fine but a little bumpy and not able to hear the intro from the sound speaker. The underwater observatory though not a large area to boast about but really the closest one can get to see the fishes swimming freely along with the live growth organism and corals without the wet suit. Must say the food in the restaurant at the jetty is one of my favourites while in Perth! It's a great trip, you go on the little train. You can close the plastic window so it is not to windy. Going down the observatory is great. It's a little bit busy with a big group and not al people have patience to wait. Smaller groups would be better. This was a great few hours to enjoy the jetty and underwater observatory. The little train was very relaxing and enjoyable. The tour guide was very well informed about the fish at the end of the jetty. The facilities and views were great. I can't recommend this enough. I bought tickets online as it was a long weekend and the process was very easy. Well worth doing. Good value for money.